The last decades have borne witness to the previously unimaginable power that activism, heralded by celebrity and coupled with social media, has to organize all members of society, forge even the most unexpected of alliances, and bring about much needed change in all realms, from politics and economics, to science, philosophy and even religion. It seems as though society cannot and will no longer stand impassible to injustice –whether perpetrated by dishonest politicians, unscrupulous key figures of the world’s financial markets, or morally corrupt religious leaders– and is finally willing to stand, together, for what is right. The latest battle is currently being played out in the realm of culture, and of classical music, in particular. Contrary to the popular assumption that the arts unfold in a sphere alien to and beyond the influence of any negative traits, the arts are, in fact, not unlike any other human enterprise. Deceitfulness, incompetence, nepotism, despotism, oppression and a notorious lack of transparency are, unfortunately, also rampant in the arts. Making matters worse, whether as a result of a deeply rooted sense of pessimism, a generalized lack of solidarity amongst artists, or an understandable fear for retaliation, cowardice had historically translated into secrecy. That was until celebrated Austrian mezzosoprano Elisabeth Kulman decided to break the silence, and to speak out and stand for her rights and those of her peers, thereby jeopardizing the fruits of a challenging and arduous professional career. In a profession dominated by the super egos of many artistic administrators and the assumed infallibility of the politicians who appoint them, Ms. Kulman had the boldness to publicly question the policies of Mr. Alexander Pereira, one of the most emblematic, influential and long standing cultural managers of recent times. Mr. Pereira, who is currently the artistic director of the world renowned Salzburg Festival, is credited for having turned the Zurich Opera House into one of the most distinguished theaters in the world, bringing not only an impressive roster of artists but also much coveted sponsorship. Ms. Kulman’s criticism was, at least initially, targeted at Pereira’s policy to only pay for performances, and thus to neither pay rehearsal fees nor to cover the living expenses arising from the weeks long rehearsal process of every operatic production, thereby leaving singers financially unrewarded for their hard work and even potentially facing substantial losses in the unfortunate event that a disease forces an artist to cancel a performance. To be fair to Mr. Pereira, however, he is hardly the only individual around to implement this or any other policies typifying the notoriously asymmetrical nature of the relationship that currently exists between artistic administrators and artists. These policies may well, in turn, be the result of the equally inordinate power that politicians can wield over artistic administrators, and which economic considerations may exert. One thing is clear, however: no number of wrongs can yield a right. The public debate about Salzburg’s rehearsal policies sparked an uncommon expression of solidarity amongst opera soloists once other key figures joined the debate. On the arts journal of cultural commentator Norman Lebrecht, distinguished American soprano Laura Aikin weighed in on the difficulties that even established singers like herself face when forced to forego rehearsal fees, which struggles become nearly insurmountable for young singers. Other artists followed suit, particularly after Maestro Antonio Pappano, music director of the Royal Opera House, Covent Garden (London), complained during the season’s launch about young opera singers being prone to cancellations, generating even further outrage. This time, artists included figures of such prominence as American superstar mezzosoprano Susan Graham and veteran mezzo Rosalind Plowright, as well as the Metropolitan Opera’s principal conductor, Fabio Luisi. Ms. Kulman is calling for an “Artists’ Revolution.” It is time for the general public to become aware of the abusive practices in our field –and to put an end to them. Just as in the corporate world, artistic administrators earn high six to seven figure annual salaries. Their employees, by contrast, struggle to make ends meet. The annual average salary of an opera singer in a German opera house, for example, is roughly $44,000 (before taxes! ), hardly enough to get by in today’s economy, and scandalously disproportionate considering they are the ones who rehearse countless hours and actually stand on stage day after day, for dozens of shows of numerous productions per year. Emerging artists in opera studios (a corps of young soloists associated with an opera house) are being exploited, some even singing leading roles for an annual compensation of roughly $15,000. Yet the costs of building and maintaining a career are exponentially high –from the financial investment required to earn a degree, to the cost of traveling to and participating in countless auditions, and the private instruction which is essential to hone and preserve any artistic skill. To make matters worse, these low fees are paired with increasingly taxing production challenges and disrespectful, disparaging work-environments. Many administrators routinely breach their contracts with soloists –some going as far, as is, notoriously, the case most often in Italy, as not paying their artists at all!– knowing full well that the latter could but will not sue out of fear of retaliation or of being burdened with costly and lengthy litigation. There is a dire need for a strong union for artists, capable of defending their rights; an affordable and expedite, yet legally binding mediation process for dispute resolution; an accreditation process to guarantee the competence of all individuals involved in artistic administration; and finally, of an independent body to regulate and constrain the activities of artistic administrators, especially since they operate, particularly in Europe, largely thanks to public funds. We must not fall into the trap of concluding that further budget reductions are required to curtail these abuses. What is necessary is transparency, fairness and competence in the handling of financial and human resources in the arts. It is vital for those who understand the crucial role that the arts play in a civilized society, to also acknowledge those who make it possible, accordingly. 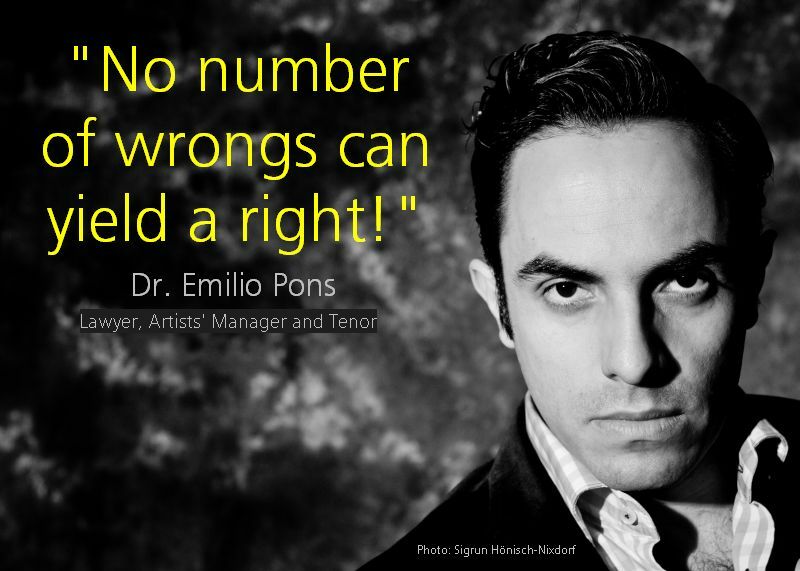 After having worked several years as lawyer, the international wellknown tenor Dr. Emilio Pons is now managing various artists as well. Die letzten Jahrzehnte haben die bis dahin unvorstellbare Macht des Aktivismus bezeugt: Angeführt von namhaften Persönlichkeiten und im Zusammenwirken mit sozialen Medien, vermag sie alle Mitglieder der Gesellschaft zu organisieren, sogar in Gestalt völlig unerwarteter Bündnisse, und dringend erforderliche Veränderungen in allen Bereichen herbeizuführen – von Politik und Wirtschaft über Wissenschaft, Philosophie und sogar Religion. Es sieht ganz so aus, als ob die Gesellschaft das Unrecht nicht länger ertragen kann und will – ganz gleich, ob es von ehrlosen Politikern, betrügerischen Lenkern der weltweiten Finanzmärkte oder von korrupten religiösen Führern begangen wird. Und dass sie für das Richtige letztlich auch gemeinsam einzustehen bereit ist. Das jüngste Gefecht wird derzeit auf dem Feld der Kultur ausgetragen, vor allem im Bereich der klassischen Musik. Ganz im Gegensatz zu der verbreiteten Annahme, dass sich die Künste in einer von allen negativen Einflüssen freien Sphäre entfalten können, sind Künstler denselben Bedingungen unterworfen wie jede andere menschliche Aktivität. Betrug, Vetternwirtschaft, Despotismus, Unterdrückung und ein geradezu notorischer Mangel an Transparenz wuchern leider auch und gerade im Bereich der freien Künste. Verschärft wird das Problem durch den allgemeinen Mangel an Solidarität unter den Künstlern, ganz gleich, ob dieser auf tief verwurzeltem Pessimismus beruht oder auf verständlicher Angst vor Vergeltungs- und Einschüchterungsmaßnahmen, Feigheit wurde stets mit Stillschweigen behandelt. Das galt zumindest so lange, bis die gefeierte österreichische Mezzosopranistin Elisabeth Kulman beschloss, das Schweigen zu durchbrechen und lautstark für ihre Rechte und die ihrer Künstlerkollegen einzutreten – dabei durchaus die Früchte einer an Herausforderungen reichen und von anstrengender Professionalität geprägten Karriere gefährdend. In einer beruflichen Sphäre, die von den Super-Egos so vieler künstlerischer Leiter und der diese ernennenden und sich für unfehlbar haltenden Politiker beherrscht wird, besitzt Frau Kulman die Unerschrockenheit, Entscheidungen eines Alexander Pereira, eines der einflussreichsten und dienstältesten Kulturmanager der letzten Jahrzehnte, ja geradezu einer Symbolfigur des Kunstbetriebes, öffentlich infrage zu stellen. Herrn Pereira, der gegenwärtig als künstlerischer Leiter der weltweit renommierten Salzburger Festspiele tätig ist, gebührt das Verdienst, das Züricher Opernhaus zu einem der bedeutendsten Theater weltweit geformt und dabei nicht nur ein beeindruckendes Kaleidoskop von Künstlern zusammengeführt zu haben, sondern eine ebenso illustre Reihe von Sponsoren. Frau Kulmans Kritik zielte zunächst nur auf Pereiras Finanzpolitik, derzufolge den Künstlern lediglich die Aufführungen vergütet werden. Weder werden die Proben bezahlt, noch die Kosten der Lebenshaltung während der oftmals wochenlangen Phase der Erarbeitung einer Opernproduktion. Ihre harte Arbeit wird den Sängern folglich in keiner Weise vergolten, im schlimmsten Fall erleiden sie sogar noch Verluste, wenn sie zum Beispiel krankheitsbedingt eine Aufführung abzusagen gezwungen sind. Der Gerechtigkeit halber muss aber erwähnt werden, dass Alexander Pereira beileibe nicht als einziger für diese Art von Finanzpolitik steht, die die heutige, geradezu notorisch asymmetrische Beziehung zwischen Intendanten und Künstlern kennzeichnet. Diese Politik ist ihrerseits lediglich das Ergebnis des überzogenen Einflusses, den Politiker auf Intendanten ausüben können, und der darüber hinaus unter dem Einfluss wirtschaftlicher Erwägungen steht. Eins ist aber klar: So wie zweimal falsch nicht richtig ergibt, kann wiederholtes Unrecht am Ende kein Recht ergeben. Die öffentliche Debatte über die Salzburger Proben-Politik löste einen ungewöhnlichen Solidaritätsschub sowohl unter Opernsängern wie auch unter anderen maßgeblichen Personen aus. Auf dem Internetportal des Kulturjournalisten Norman Lebrecht wies die renommierte amerikanische Sopranistin Laura Aikin auf die selbst etablierten Sängern wie ihr begegnenden Schwierigkeiten hin, wenn selbst sie auf die Zahlung von Probengeldern drängen müssen, was für junge Sänger quasi unmöglich ist. Andere Künstler legten nach, vor allem, nachdem Maestro Antonio Pappano, der musikalische Leiter des Royal Opera House, Covent Garden (London), durch seine Äußerung für Empörung sorgte, dass gerade junge Opernsänger während der Saison zu Absagen neigen würden. Daraufhin beteiligten sich sogar hochrangige prominente Künstler wie die amerikanische Star-Mezzosopranistin Susan Graham, die „Mezzo-Veteranin“ Rosalind Plowright und der Chefdirigent der Metropolitan Opera, Fabio Luisi. Frau Kulman ruft nach einer „Revolution der Künstler“. Es ist an der Zeit, dass die Öffentlichkeit über die verheerende Praxis in unserem Bereich aufgeklärt wird, um diese Missstände beseitigen zu können. Ebenso wie in der Firmenwelt, verdienen auch die künstlerischen Leiter das Sechs- oder Siebenfache eines durchschnittlichen Jahresgehaltes. Im Gegensatz dazu müssen ihre Mitarbeiter darum kämpfen, finanziell über die Runden zu kommen. Das durchschnittliche Jahresgehalt eines Opernsängers an einem deutschen Opernhaus beträgt etwa 35.000 € (vor Steuern! ), kaum genug, um damit bei den gegenwärtigen wirtschaftlichen Verhältnissen zu existieren und geradezu skandalös unangemessen, wenn man bedenkt, dass sie unzählige Stunden proben und nahezu jeden Tag auf der Bühne stehen für Dutzende von Shows und zahllose Produktionen jedes Jahr. Nachwuchskünstler in Opernstudios (eine Gruppe junger Solisten, die mit einem Opernhaus verbunden sind) werden ausgebeutet, wobei einige sogar Hauptrollen für eine jährliche Vergütung von nicht einmal 12.000 € singen. Schon die Kosten für den Start und auch die Begleitung einer Karriere sind außergewöhnlich hoch – von den Investitionen, die bis zum Erreichen eines Abschlusses benötigt werden, über die Reisekosten und die Teilnahme an zahllosen Vorsingen bis hin zu Privatunterricht, der für das Reifen und Bewahren der künstlerischen Fertigkeiten unabdingbar ist. Und was die Sache noch fataler macht: Diese niedrigen Gehälter treffen auf immer anstrengendere und herausforderndere Produktionen bei gleichzeitig immer respektloseren und von Geringschätzigkeit geprägten Arbeitsbedingungen. Viele künstlerische Leiter brechen fast schon aus Routine ihre Verträge mit den Solosängern, und einige gehen sogar so weit, vor allem in Italien, dass sie ihre Künstler überhaupt nicht bezahlen! Und das im vollen Bewusstsein, dass der Sänger sie zwar verklagen kann, sich dies aber aus Angst vor Vergeltung oder vor hohen Kosten und einem langwierigen Verfahren nicht wagen wird. Deshalb benötigen wir ein starkes Bündnis der Künstler, das in der Lage ist, ihre Rechte zu verteidigen, einen notwendigen, raschen und rechtlich bindenden Mediationsprozess für eine zu erstreitende Resolution, einen Prozess der Akkreditierung, um die Kompetenz aller in die künstlerische Leitung einbezogenen Personen zu gewährleisten und schließlich eine unabhängige Instanz, die die Aktivitäten der künstlerischen Leiter regelt und – wenn nötig – korrigiert, besonders dann, wenn diese, wie zu einem guten Teil in Europa, größtenteils mit öffentlichen Geldern operieren. Wir dürfen nicht in die Falle tappen, zu glauben, dass weitere Budgetkürzungen erforderlich sind, um diesen Missbrauch zu beschneiden. Was wir benötigen, ist Transparenz, Fairness und Kompetenz im Umgang mit den finanziellen und menschlichen Ressourcen im Kunstbereich. Es ist essenziell, dass diejenigen, die die Schlüsselrolle der Kunst in zivilisierten Gesellschaften verstehen, auch die entsprechende Anerkennung für die Künstler, die die Künste ermöglichen, zum Ausdruck bringen. Dr. Emilio Pons arbeitete mehrere Jahre als Jurist und ist heute international tätiger Opernsänger (Tenor) und Künstlermanager. Many thanks for another excellent write-up. Exactly where different may just any individual obtain that form of information and facts in this the perfect means of creating? I own a business presentation a few weeks, and I’m for the seek out like info.